After a very busy/tiring few days, which included my son having friends over for a sleepover last night, Sunday is quiet and peaceful and the family are all taking naps. 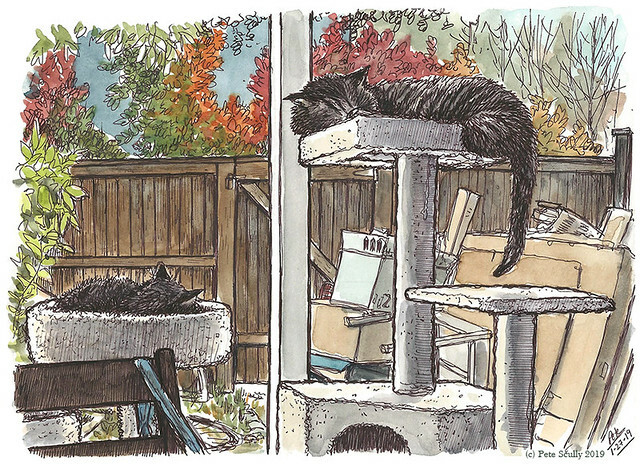 I took the peaceful time not to go out and draw in the sunshine, but to sit in sweat pants and listen to podcasts and draw the sleeping cats. Pay no attention to the boxes piled up outside, that’s a job for later this afternoon. I’ve been listening to Adam Buxton’s podcasts lately which have been entertaining in their niceness. I had to paint fast as the colours outside kept changing as the noontime January sun kept shifting position. I’ve had a good idea for a book which I am thinking of spending the rest of the day working on. After I’ve done some tidying up.